Now, Natalie Portman has won an Oscar and is starring in several big box office films. She is also making headlines for standing up to Dior's John Galliano and speaking out against his anti-Semitic slurs. Hadassah issued a statement last week praising the actress for her courageous stand. And then, I'm sure some Google searches by Hadassah staff and members turned up the various blog posts from 2005 about the $5 million gift that turns out to be a misunderstanding. So, six years went by and no one seemed to question this erroneous donation? 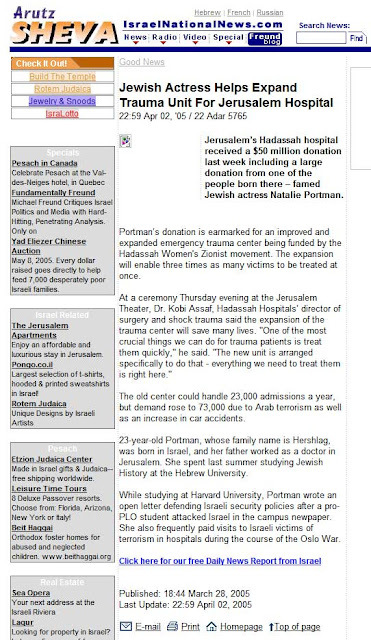 I did a little research and it turns out that a woman named Phyllis commented on a blog in April 2005, stating "she [Portman] didn't donate $50 million personally-they received donations of $50 million and her donation was included in that re-read the article: 'Jerusalem's Hadassah hospital received a $50 million donation last week including a large donation from one of the people born there -- famed Jewish actress Natalie Portman." "This 'story' was originally misreported exactly six years ago this month when Hadassah announced it had raised $50 million in just two short years from quite a variety of sources for a new center for emergency medicine. Natalie Portman appeared at the event but did not contribute to the center. 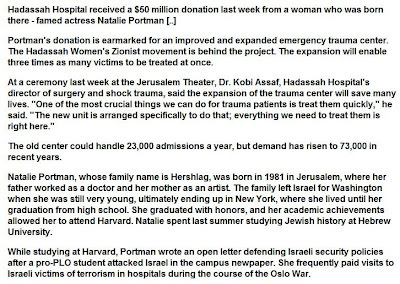 For some unknown reason, last week, people began to re-circulate the very old, very wrong version of the story claiming that Portman had made a $50 million donation. Hadassah would be grateful if you would post a correction to this post. This was obviously no fault of yours. But these things quickly take on a life of their own. Thanks very much." So, I am hereby retracting the misinformation that was published on this blog in March 2005. 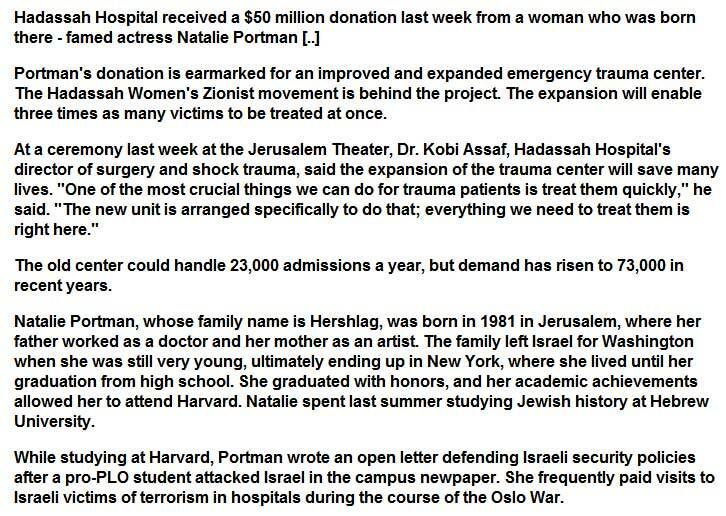 Natalie Portman has been a strong supporter of Hadassah Hospital and I'm sure she will continue to be, however, she never made a $50 million donation to the expanded emergency trauma unit. I'll conclude this post by reminding everyone that the new Sarah Wetsman Davidson Tower at Hadassah Hospital, named for the mother of the late Jewish philanthropist Bill Davidson of Detroit, is still in need of funds and I encourage everyone to contribute to this important cause. From one Hadassah supporter in Cincinnati, Ohio -- the viral marketing regarding the "gift" had reached me very quickly. I appreciate your retraction/clarification here.